The competitive bbq season has closed another chapter for Ms. Goofy and I. This weekend was our last contest of the year. 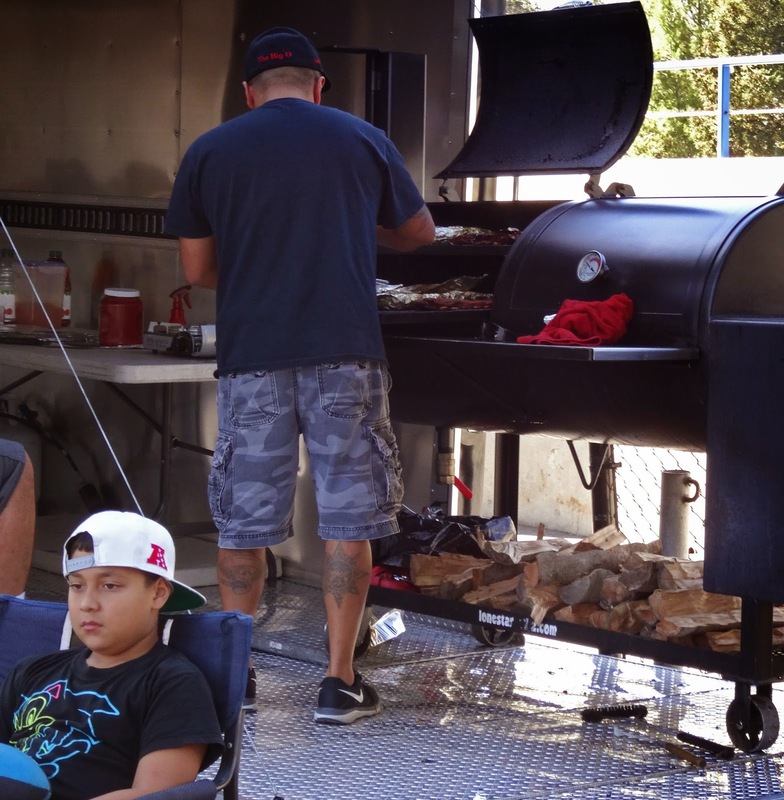 We traveled to San Jose, California to the University of San Jose Spartan stadium to judge a rib only contest. 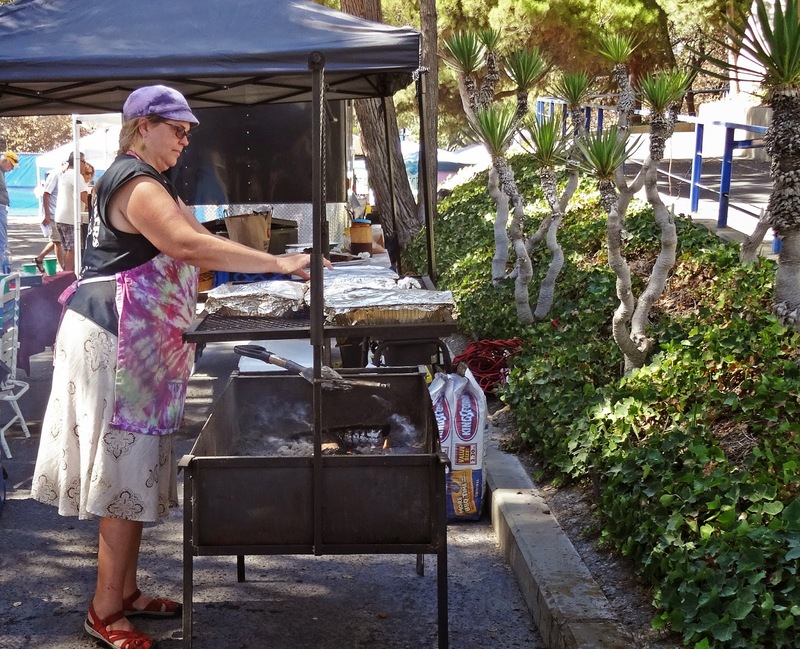 ‘Sparta- Q’ was a fundraiser for the Women’s softball team. The stars today were 40 bbq competitors lined around the stadium cooking some of their finest pork ribs. 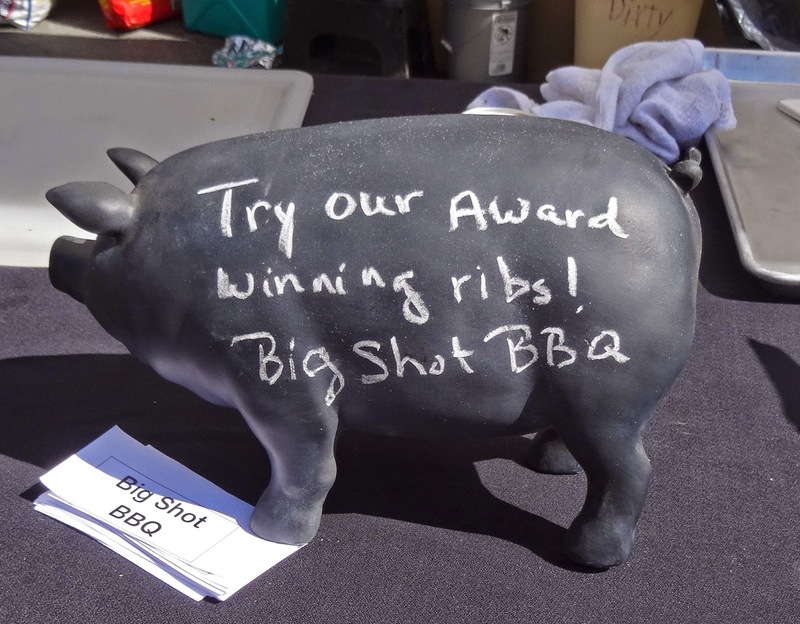 They paid an entry fee and were provided five racks of ribs for judging and participant consumption. Our duty was to enjoy and judge these fine smoked meats. We would like to share some images with you. This event was full of different places to eat. 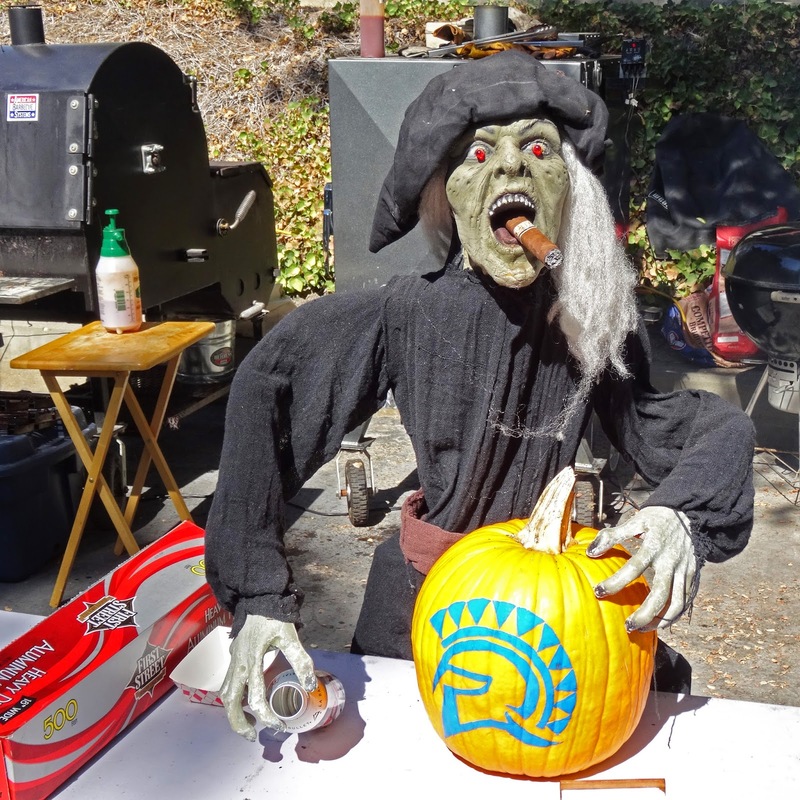 You could partake of ribs and many other items provided by Spartan boosters and Kinders Meats. Participants would stroll the perimeter of the stadium to make choices of food and see the competitors decorated booths. On this walk they would pass by several live bands. A silent auction with plenty of Spartan centric items were displayed for bidding.. If you walked the whole loop you would eventually come across the judging area to witness Ms. Goofy and I at work/play. 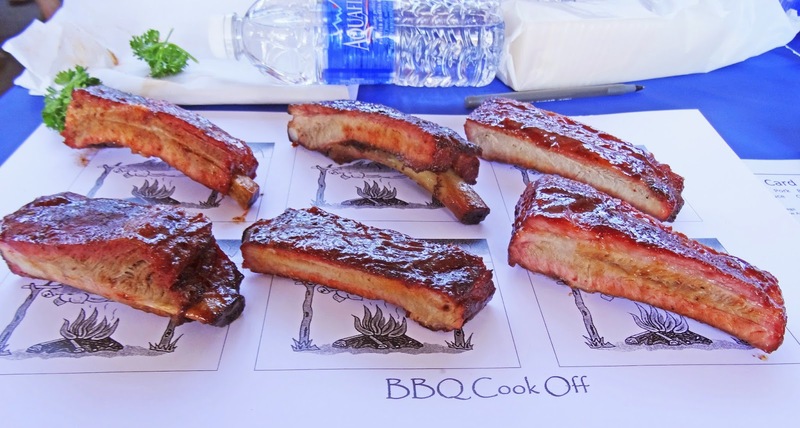 This was a rib only contest but we used KCBS rules as a guideline in our judging criteria. One very noticeable difference was the judging was held out in the open. The public and competitors were able to witness us apply our trade. Ms. Goofy was a little unnerved because one particular team was staring her down watching her every reaction to her tasting bites. It was all in fun because we are all friends. The judging was still blind because we only see a number associated with each rib. 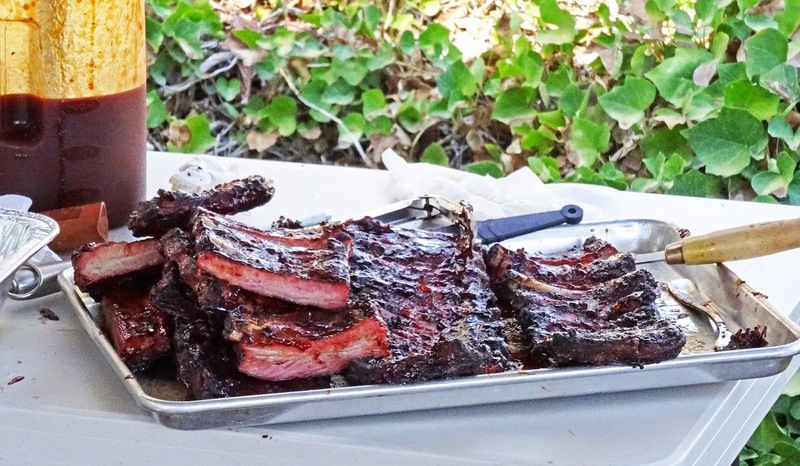 We sampled and scored some of the best ribs in Northern California. Our judging duties were done and it was time to socialize with our friends. 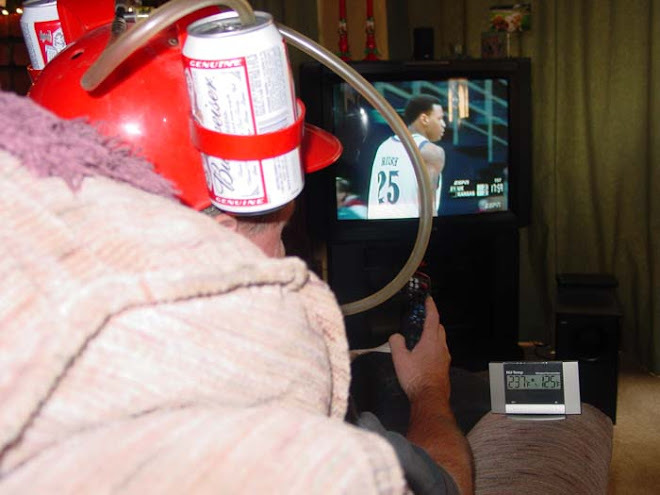 Cold beverages were available for you pleasure. 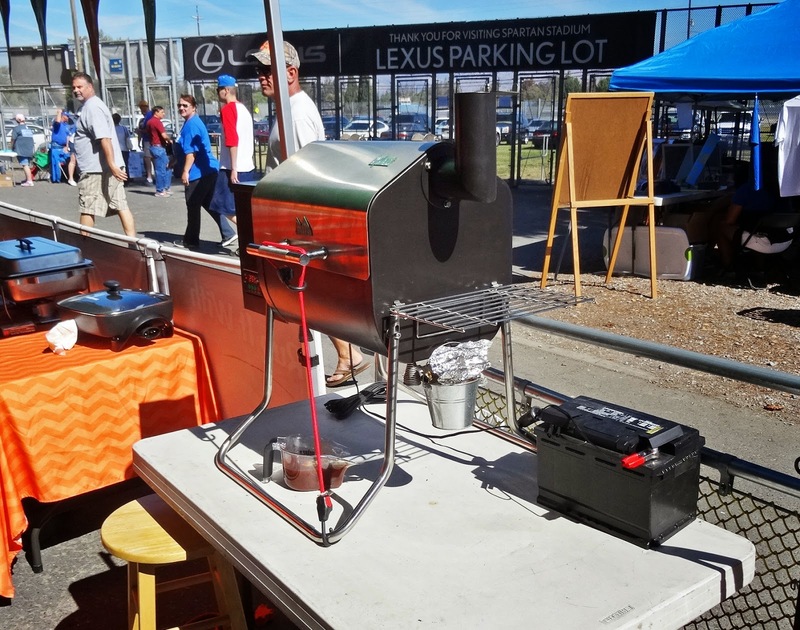 I wanted to mention Rob Ryan’s bbq rig powered by a car battery. It definitely caught our eye. You see something new all the time. 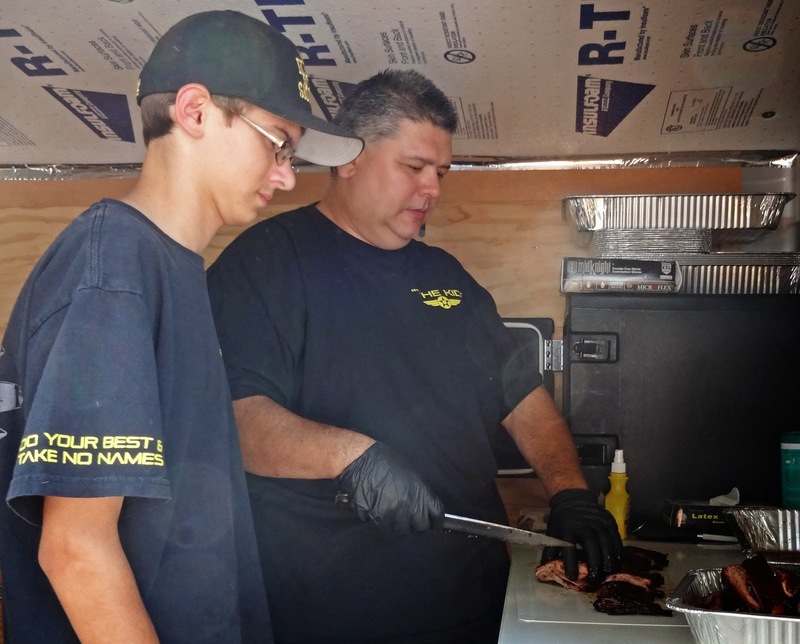 The scores were tabulated and the bbq team ‘Canyon Riders’ took the trophy. It was a wonderful day. It was a little bittersweet because it was our last contest of the year. Our next contest is not till February in Lake Havasu. 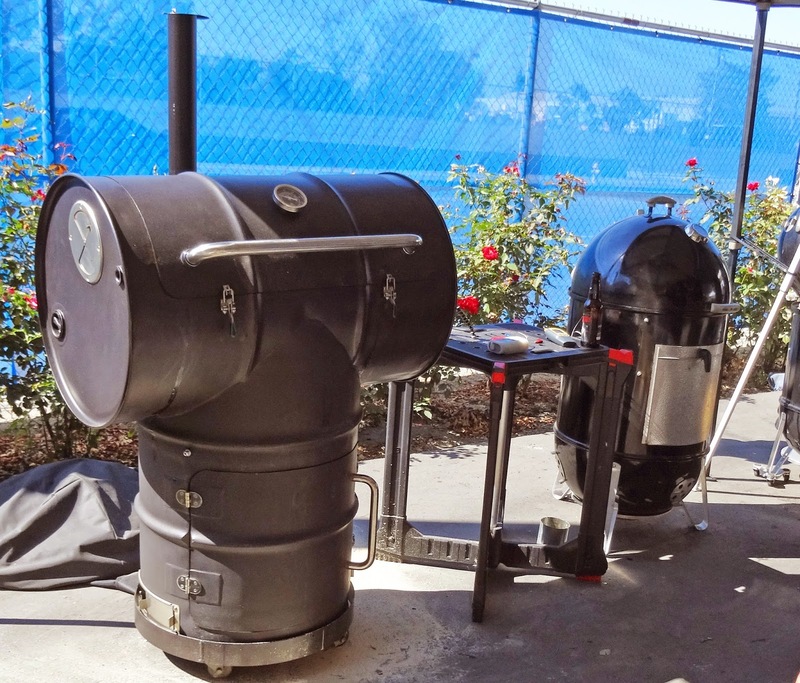 We will not be idle in the competitive bbq arena. We will be attending an advanced judging seminar to sharpen and hone or judging skills. We also will be cooking bbq to keep our palates sharp. 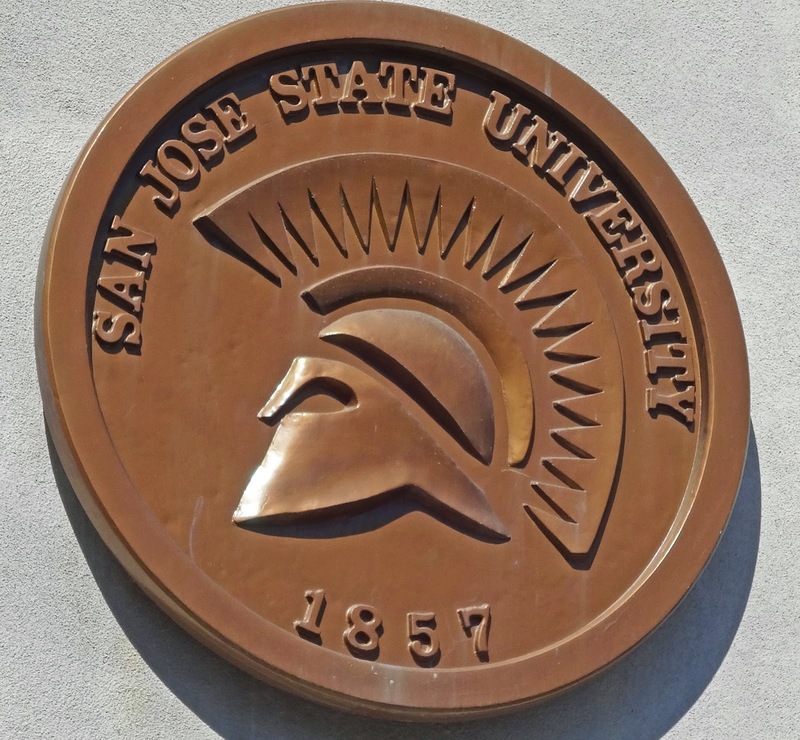 We were privileged and happy to help out at Sparta-Q benefiting the University of San Jose Women’s Softball team this weekend. those ribs are looking good! Good times in meat adventure land! Greg, They were good. Some better than others but as a whole most excellent. 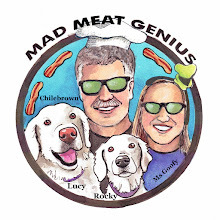 We love Meat Adventures.